Most people feel that all toilets are the same. This is not true. Not all toilets have to look the same and they definitely do not have to perform the same. The Saniflo Sanicompact 48 is a prime example of how unique a toilet can be. 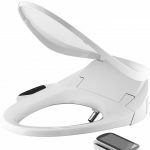 To learn more, you should take a look at the Saniflo toilet review to find out about a toilet that will change the way you view toilets. 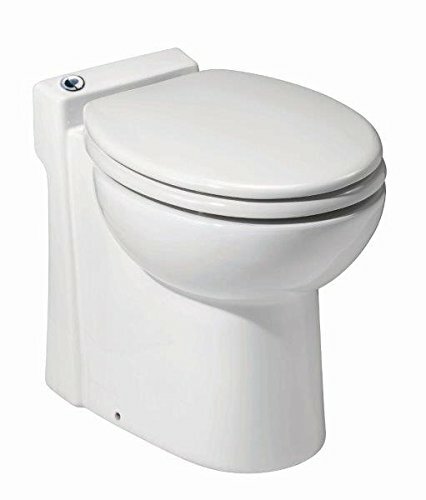 This is a one-piece toilet that does not have the typical tank area above and behind the bowl. This is because it uses only about a gallon of water per flush and the built in macerating pump cycle flushes it when you simply push a button. A macerating pump turns large solid waste into smaller particles so that it is easier to flush out. 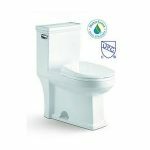 The little bit of water that it requires, proves that it is designed to be an eco-friendly toilet. This toilet is able to fit into areas where you have always wanted a toilet, but couldn’t put one. It is ideal for attic spaces that have lower ceilings, under stairwells, in lofts, tiny houses, and more. 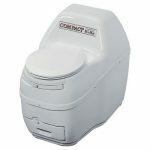 In fact, its featured in our list of top 5 compact toilets for small bathrooms. Not only it is smaller in height thanks to the lack of a toilet tank, but the pumping action is beyond anything most people have ever dreamed. It can pump water out vertically for 9ft or it can pump water out horizontally for 100ft. This enables you to add a bathroom where you want it, not just where the current plumbing will let you put it. As an added bonus, you can also hook a sink into it to further ensure that plumbing is made easy. You could even put this in the bedroom for someone who may be bedridden and unable to make it to the standard bathroom down the hall or across the house. The hinges of this toilet seat are chrome. 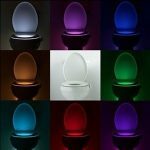 They are included along with the toilet seat and lid. There is also a chrome push button to make operating the toilet easy for everyone. Inside the toilet, there is a non-return valve to prevent any chance of wastewater flowing back into the toilet after the flush is completed. 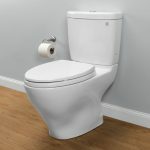 You will want to ask about your local area codes regarding toilets, but this is a forced main so that it will not need to be vented or connected to a vent stack like some toilets. However, you will want to connect the macerator pump to a ground fault interrupter circuit since you will have to use a 110 outlet and water with this toilet. This is so that you do not have to worry about water and electricity being used together. The Sanicompact 48 measures 15.75” H x 14.5” W x 18.25” D. It weighs only 62 pounds. 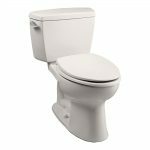 It is definitely the smallest of our other compact toilets, such as the Kohler Santa Rosa. Do Owners Love the Sanicompact 48? The Saniflo 48 has an average rating of 4.4-stars on Amazon. Most people say that it is a great toilet to own, but that you must ensure that it is properly installed and that the toilet’s instructions are not the most detailed. 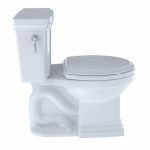 Therefore, if you are not sure how to install a toilet, you may need to hire someone else to come and put it in your home. 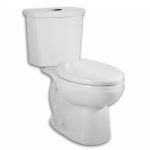 They like that you do not have to deal with tearing up your floors to install the toilet, so it is a great option for anyone trying to install in a hurry and without much work involved. 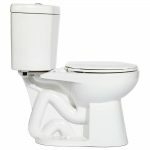 There are some people who feel that it does not flush out properly and that the toilet can leave odors because of it. This could be because they did not install it right since most owners have not had an issue with this. There are some owners who have used this toilet as an extra bathroom in their home for years. 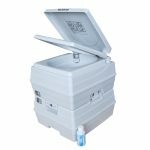 If you need a toilet that you can install quickly without doing a major renovation, you will probably enjoy having the Saniflo Sanicompact 48 installed in your home. It requires only a water supply and a pipe to rid the toilet of waste. This means you can put it anywhere you need a toilet. The price is only slightly more than a standard toilet and you avoid most of the mess. We feel this makes it a reasonable option for most people. It is too convenient to say otherwise. Ready to Make the Saniflo 48 Yours?